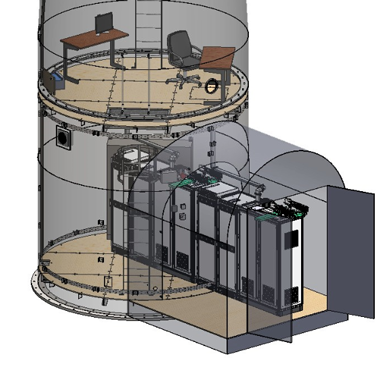 Easat provides Equipment Shelters to house all applicable radar equipment; these can be used for air traffic control and coastal surveillance applications. For optimum performance an equipment cabin should be located close to its associated radar antenna to reduce respective waveguide run. Equipment shelter may be located on existing pre-cast concrete foundation, for example, within the confines of a lattice tower base, or on an adjacent concrete slab. Easat supplied equipment rooms are air conditioned to maintain room temperature at approximately 22°C using an air conditioning and heating system. The units are operated via an environmental control panel which provides power to the units and fault indication. All Easat-supplied equipment rooms are illuminated internally with fluorescent strip lights. Floor panels are structurally reinforced to accommodate the heavy loads of UPS and battery cabinet. The equipment room also contains inverter for motor control, fire alarm panel, intruder alarm panel, waveguide dehydrator and safety switch. 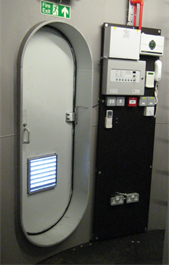 All equipment is pre-installed where practicable to reduce on-site installation time. Equipment room can be established within the base of Easat-supplied Monotube Tower, thereby ensuring maximum safety and security of relevant equipment. In the event that customer supplied radar equipment will not fit within the base of a Monotube Tower, Easat can provide an 'igloo' shelter which is external to, but attached to the Monotube Tower. For offshore radar installations (eg. on an FPSO) any suitable room within vicinity of antenna tower can be adapted to form an equipment room. Monotube Tower Schematic inside base of Monotube / Monotube Tower door, viewed from inside equipment room.